Refraction, or "bent" light ! Is it possible to demonstrate reflection and refraction of light on lessons of physics in a more interesting way? Does a lesson on basic properties of light have to be a boring reasoning on a board, remembered by students only until the first test? We present here a highly spectacular and non-intuitive experiment, which allows to measure Snell's laws, explains why we can see setting Sun, even though it is actually below the horizon, and which explains how mirages are created. The time of preparation - about 20 minutes (4 hours before the lesson! ), the cost - few Euros. 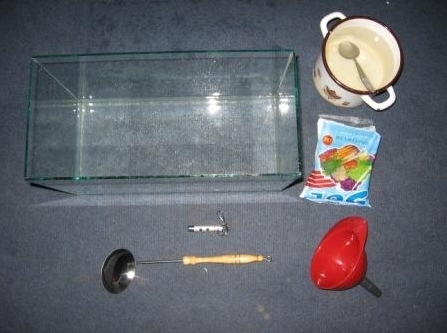 Pour about 3 liters of water into the aquarium. Dissolve salt in 1.5 liters of cold water in a separate vessel (e.g. in a bottle or a pot). 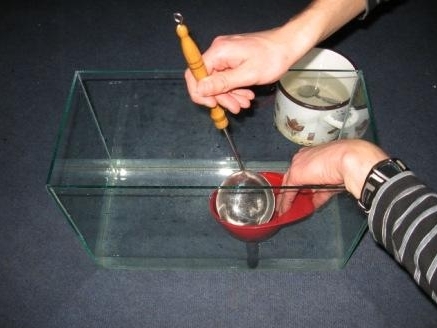 Using a funnel pour the prepared brine to the bottom of the aquarium, as shown on figure 2. After adding the brine, a borderline between a salt and clean water shall be well visible. When you point a laser indicator into the aquarium, it will be possible to observe a trajectory of light. In a such prepared system you can verify Snell's refraction law or measure the angle of a total internal reflection for the borderline between clean water - salt water. If you wait 3-4 hours, the final effect shall be much better. As a result of diffusion, a borderline between the two liquids becomes "blurred". A gradient of salinity is formed. Even if you point the light parallel to the water level, the laser beam will fluently deflect, as shown on figure 3. It is recommended to conduct the experiment in a dark room. Fig. 2. Pouring a brine to the bottom of the aquarium is a key stage in the experiment. Rys. Fig. 3. The experiment is the most spectacular in a dark room. 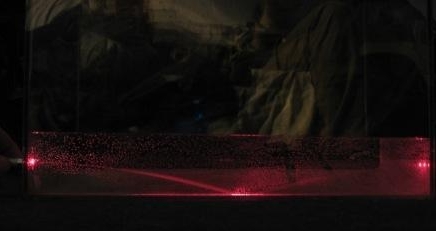 A borderline between a salt water and a clean water is still well visible but a beam of the laser indicator pointed parallel to that borderline bends forming an arch. It is also possible to see an effect of reflection from the bottom of the aquarium. Light moves along a line that guarantees the shortest TIME of travel between the points. Light velocity depends on a refraction coefficient of a medium in which it travels. Normally, a body travels slower in denser media. A good and often cited analogy to a movement of light is a trajectory of a lifeguard who approaches to a drowning person. For a drowning person each second is important, therefore a lifeguard shall approach to him or her as quickly as possible. A good lifeguard knows that he will move quicker on the beach than in water. For that reason, he doesn't approach a drowning person in a straight line, but rather modifies the trajectory to move along the beach as long as possible. The similar situation occurs in case of light - it bends on the borderline between two media in a way that will guarantee the shortest journey possible through the medium in which it moves slower (with bigger refraction coefficient, normally with higher density). As a result, light deflects towards the medium of higher density. In nature, a borderline between the media is rarely "clear". Therefore, we do not observe a sudden change of light, but a "smooth" version of refraction - light changes direction gradually. In the described experiment we deal with such a situation. The beam light, as shown in figure 3, gradually deflects from a direction parallel to the water level. Fig. 4. The trajectory of light rays - phenomenon of refraction. You can observe an analogous situation in much larger scale in everyday life. The Sun, which is actually located below the horizon line, is registered by our brains as if it was above the horizon. It is connected with the variable density of air in our atmosphere, ranging from highly rarefied in upper layers to extremely dense near the Earth's surface. Deflection of rays is known as refraction. On figure 4 you can see a diagram of such a phenomenon. A mirage is another typical example. Air above heated asphalt road or desert sand is thinner. Light "turns" according to the air density. Then you can see phenomena shown in figure 5. 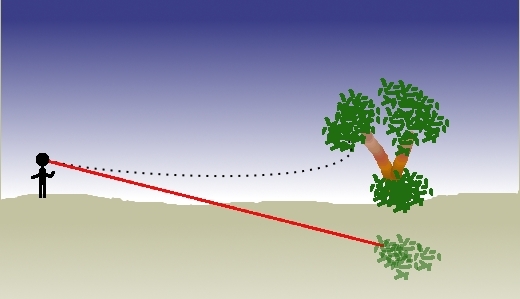 A diagram of mirage has been presented on figure 6 - light reflected from tree leaves propagates along the dotted line. 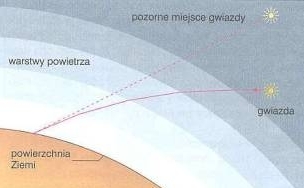 An observer's brain is unable to reconstruct an exact ray's trajectory, so it reconstructs an image along the red line. As a result, the observer sees trees hidden in the desert sand.